Thank you for subscribing to AllPopArt emails and newsletters. AllPopArt is the leading source for personalized portraits based on your photo. Please enter the following information and we will keep you updated with suscribers-only special sales and promotions. 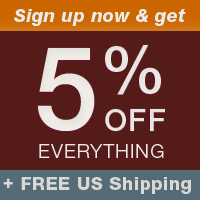 Once you subscribe, we will email you a coupon for 5% off any item on our website. Our E-mail policy: AllPopArt will never share your e-mail address and you can opt-out or unsubscribe at any time. 5% coupon cannot be combined with any other offers, promotions & discounts.